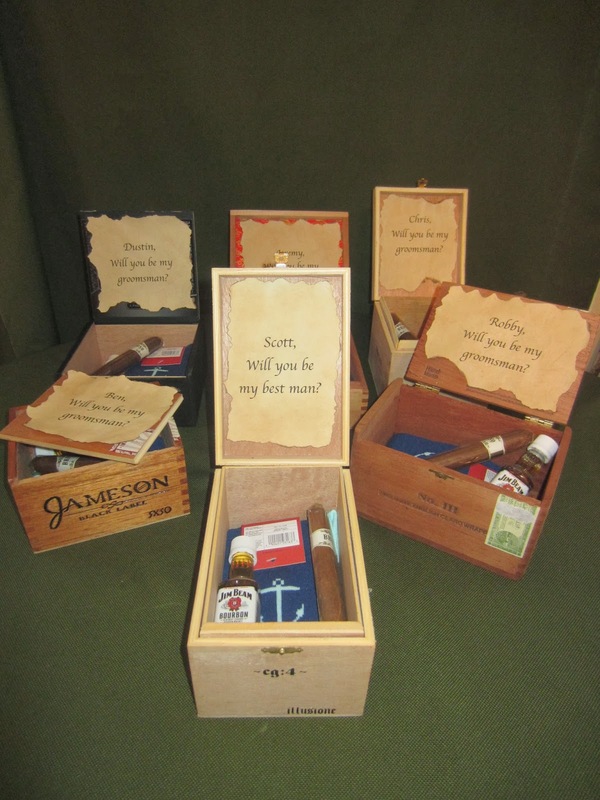 I knew from all the Pinterest ideas that I have discovered that I wanted to do something special for our groomsmen. I found an AMAZING box that had a bow tie, bottle of Jack Daniels and cigar in it. 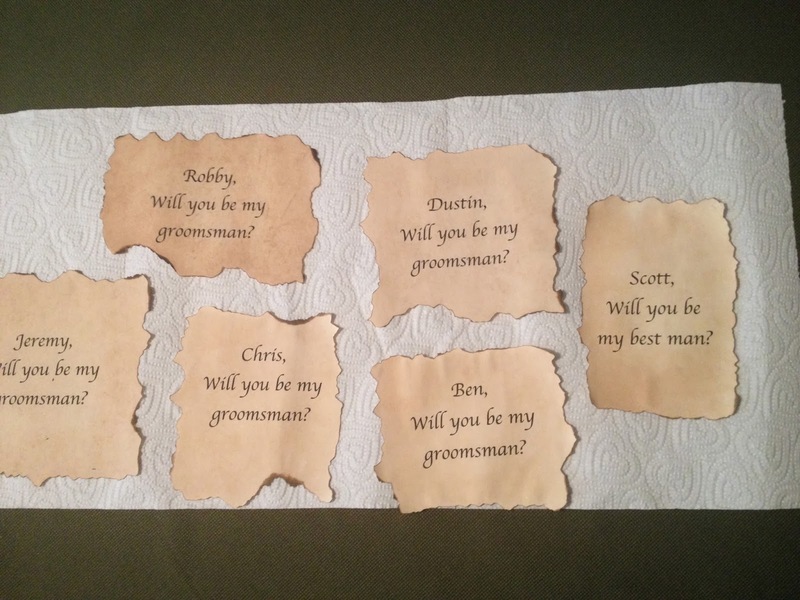 Since we have 6 groomsmen I figured that wasn't budget friendly so I started getting crafty. I ended up with cigar boxes filled with nautical socks, a mini bottle of Jim Beam and a cigar. I wanted to make the boxes special and make sure the guys knew exactly why we were giving them to them. 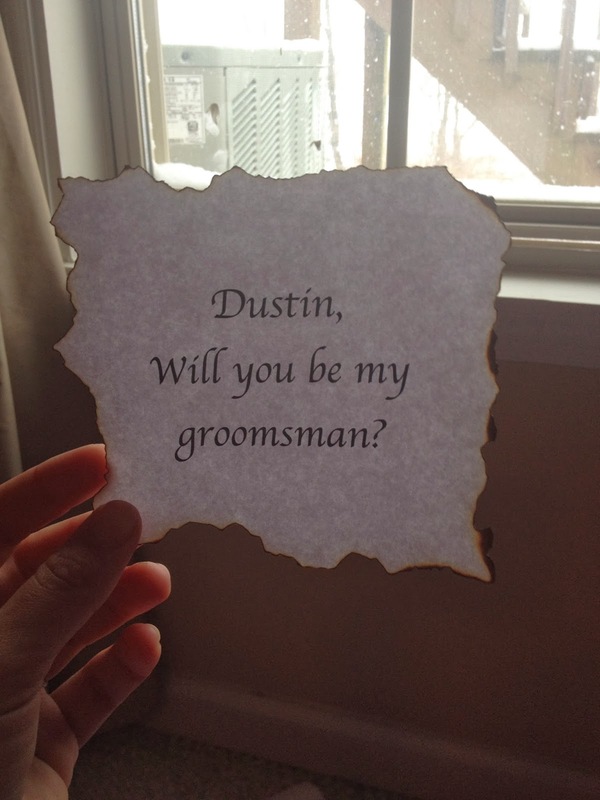 Each one said "Will you be my groomsman?" 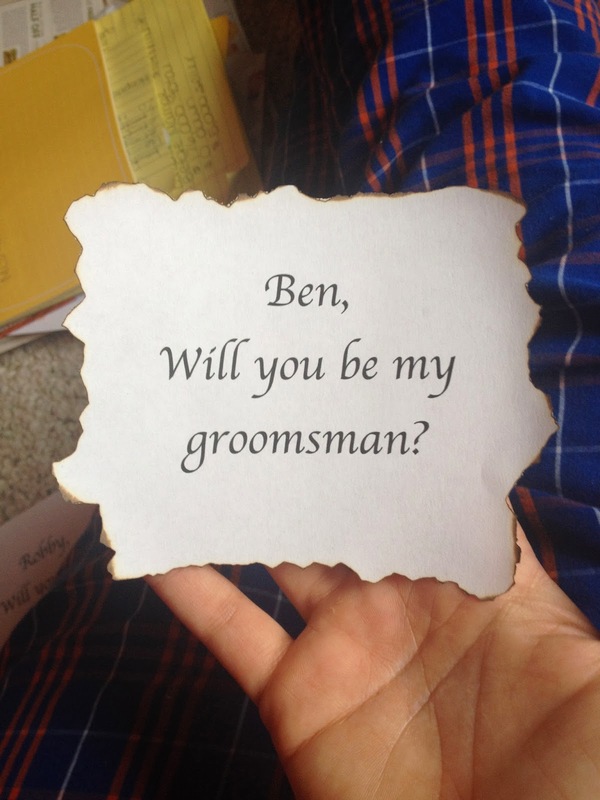 with the exception of the one what said "Will you be my best man?" for J's brother. I loved the printed font but hated the stark white paper. I found some tutorials online that showed tea dyed paper ideas but they seemed tricky. If I can do it, I promise you can do it! 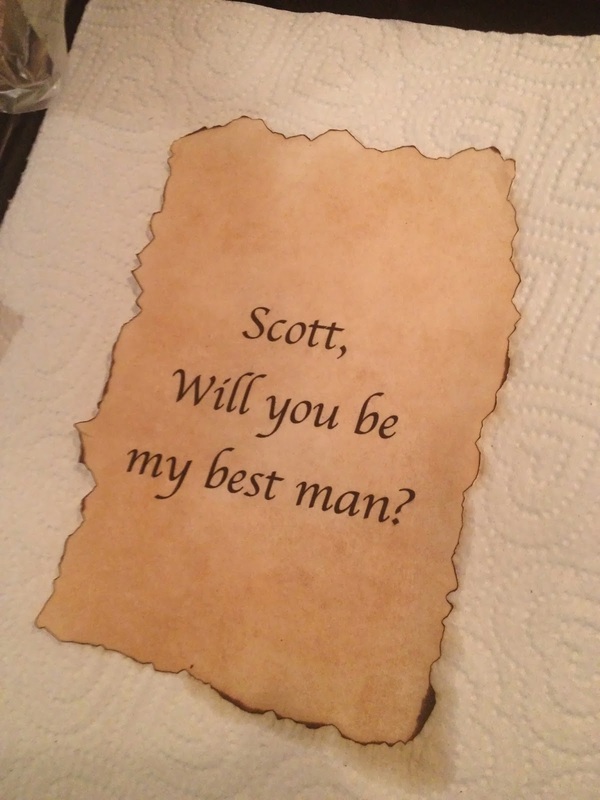 I started with the regular printed paper and burned the edges just slightly. I steeped 10 bags of regular lipton tea. I took each piece of paper and placed it in the dish. I took a tea bag (be careful they are VERY hot) and dabbed the paper with the tea bad until it was the color I desired. Note: it will dry lighter. You can see here I have taken out the paper and this is my send round of dying this piece. It needed to be a little darker. When you're done, pat it dry with paper towels and place on dry towel to dry. Ta-daaaaa! So happy with how this turned out. 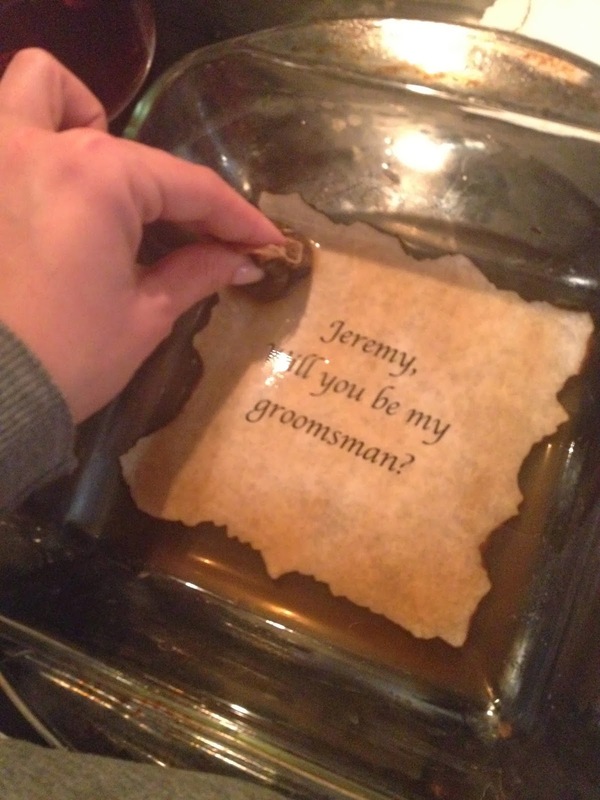 It was super easy and the groom loved how old the paper looked. So easy and cheap too! 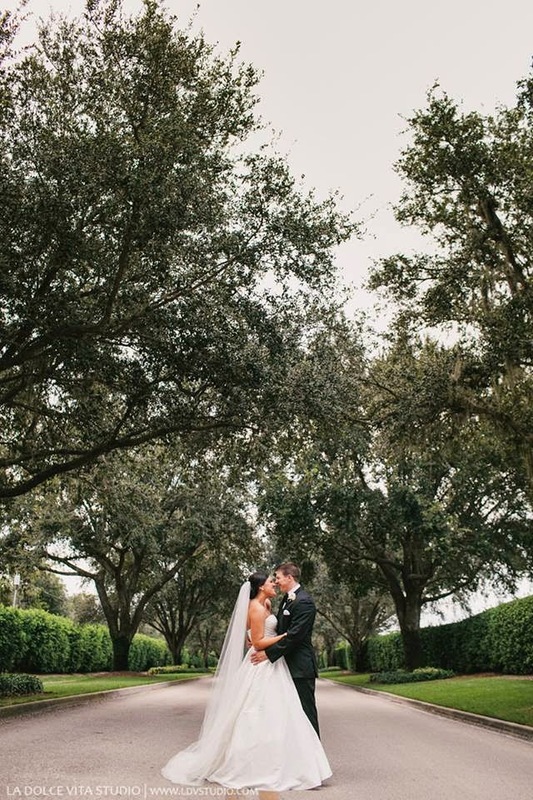 We love how these turned out. These gentlemen are all very special to us. We cannot wait to have them stand up there with us on our special day.